Friends of the Lake Champlain Maritime Museum often tell us about their favorite part of our campus. Some visitors love to explore our numerous exhibits on maritime history while other guests enjoy checking out the work going on in the Conservation Lab, Boatshop, or the Blacksmith Arts Center. LCMM is also well-known for our working replica fleet, featuring the Revolutionary War Gunboat replica Philadelphia II and our 1862-class sailing canal schooner, Lois McClure. You may be surprised to learn then, that since 2000 LCMM has been home to the Maritime Research Institute. The MRI is composed of archeologists, conservators, historians, and researchers with a passion for protecting and sharing the underwater cultural heritage of Lake Champlain. We are also actively involved in archeological dives and projects throughout New England and Canada. 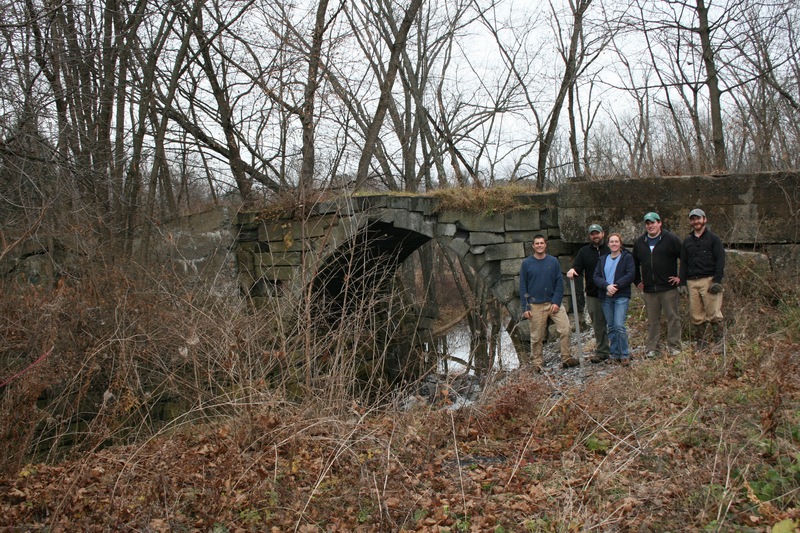 This past winter, LCMM/MRI staff members conducted an archeological survey of remaining Champlain Canal and Feeder Canal features in Fort Edward, NY. The area has been a site of strategic importance since the first British fort was erected there in 1709. The town played a role in the French & Indian War, the American Revolution, and the War of 1812. From 1822-23, the Champlain Canal was constructed in Fort Edward, and the New York State Barge Canal was completed between 1905-1913. After months of careful planning, examining historical maps, and conducting archival research, MRI archeologists Adam Kane, Chris Sabick, Sarah Tichnouk, Paul Gates and Alex Lehning traveled to Fort Edward for several days of archeological fieldwork. The team spent days exploring the woods, hills, streets, and waterways of the town looking for any remaining examples of the canal systems. Each potential site was meticulously documented with photographs, GIS (geographic information system) information, written observations, and sketches. 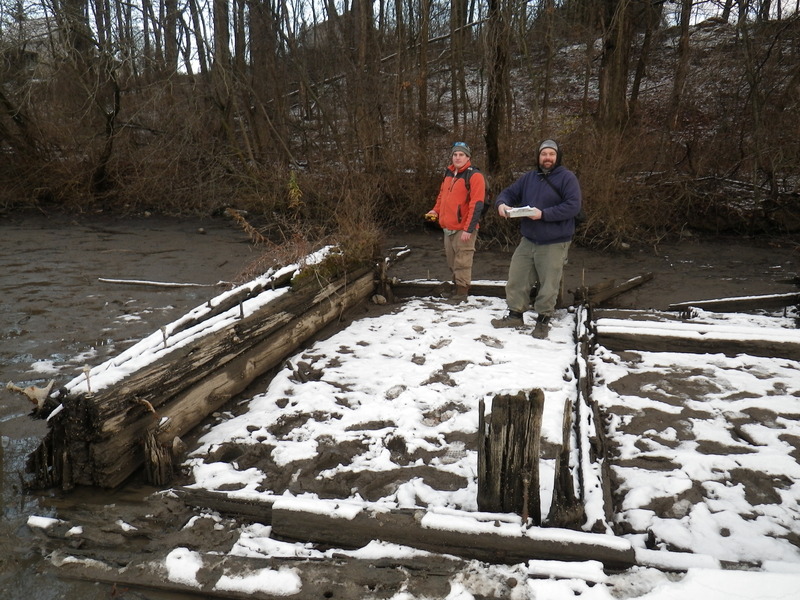 A number of features were discovered, including canal walls and channels, a stone arch and bridge, a series of locks, and even a shipwreck (though it was only an abandoned barge)! Overall, it was a very successful expedition, and the MRI plans to conduct further research on their Fort Edward findings throughout the winter and spring. The MRI is grateful for all the support and assistance we received during our stay, with special thanks to Paul McCarty of the Fort Edward Historical Association. Alex works as a Conservation Technician with the Lake Champlain Maritime Museum and in his free time volunteers as a Merit Badge Counselor with the Green Mountain Council/Boy Scouts of America.